Aluminum is an extremely useful metal for manufacturing different products. From making planes and cars to interior decorations, this material is one of the most popular, in the world of welding. As a practicing welder, you will know well the importance of aluminum in the industry, due to the huge demands for it from customers. Welding is a process that uses heat and electricity to join two or several pieces of metal together. Different types of welding focus on different kinds of metals since each metal have a unique melting point. Being a very popular material to work with, various aluminum welding techniques have cropped up over the years. Some people treat welding as a hobby and work from home. Unlike many professionals, they may not know the many methods one can use to weld aluminum. While there are a few welding techniques, which especially work best on aluminum and its alloys, some other methods can be used too. These have slightly different processes but work the same in joining two pieces of metal together. However, welding gives metals relatively the most strength. It is not just about knowing the techniques but having enough skill and knowledge to carry out the processes correctly. Welding is very tricky work, and if you do not pay extra attention to your methods, the quality might not be right. And no one wants to buy a less than perfect product. Now, there are a few techniques you can use to weld aluminum. If you are a professional welder and own all the necessary equipment for a complicated process, you can go for some of these variations. However, there are a few methods that are meant for welders who do it as a hobby at home, too. This stands for Tungsten Inert Gas Welding and is one of the many easy ways you can weld aluminum. This process uses inert gases to maintain a suitable environment for welding metal. The use of metal tungsten is essential for aluminum welding. You will also need a filler metal to feed into the weld pool when it forms during your work. This is a process that will show you how to weld aluminum with a torch. You also must make sure the metal you are working with is reliable. It is vital that the welding environment has no contaminants, thus, the use of inert gases. TIG welding can be done in both AC and DC. If you want to weld AC, your tungsten will need to have a ball at its end. To create the ball, first, attach your tungsten to the torch you will be using. Make sure your machine is on DC plus, then light your torch for just a few seconds. You will see that the heated-up torch has formed a ball at its end. Once the ball is established, you are good to go. Remember to turn your machine back to AC, as that is the current you will be working with. Now, aluminum normally has a layer of oxide on its surface, which makes welding it much more difficult. You will want to wipe down the metal with a cleaning oil or acetone before you start. If your tungsten is somehow contaminated, it will not perform as well. You will notice that the quality of your weld is not satisfactory so that it will be a waste of time. It is very important to carry out the process of welding right. You do not want to add the filler metal too soon or too late and mess up the method. Start your machine and point it toward your base metal. Make sure you are holding your torch at a 15-degree angle, and no more than that. Start up your torch and wait until it melts the metal and forms a weld puddle. You must only introduce the filler metal once a good puddle has formed. Take the filler metal rod and add it to the weld pool every few seconds, as you move forward, slowly and steadily. As aluminum is quite prone to cracking, you will want to add a little extra filler at the end. Then, slowly decrease the amount of your current so that the puddle can solidify. Once the torch is completely turned off, you will be free to view your solidified weld. Welding is a hazardous technique, so remember, before you start working, always put on your protective helmet, gloves, and jacket. While welding is an excellent way of joining and making metal products, it is also quite risky and complex. Those of you who want to learn how to join metals without a welder at home, you might prefer a more natural method. This particular method is called brazing, and it may not create an as strong bond as welding, but it still definitely does serve the same purpose. The best part about this technique is that you won’t need much equipment, just a propane torch, aluminum brazing rods, and the base material. These, you can get for cheap at any hardware store! Before you begin brazing, you must always remember to get your aluminum pieces perfectly clean. This you can do with acetone or some cleaning oils. Cleaning the base material will guarantee a better bond between the metals, as no pollutants will interrupt the brazing process. Note that the melting point of aluminum is around 1200 degrees, but that of the brazing rod is only 700. In this process, you do not need to melt the base material, just the rod that will act as a filler metal. So, when you start up the propane torch, focus on the base material but do not linger so long that it will start to melt. Run the rod along the joint between the two pieces of aluminum, so that it gets most of the heat from the torch. Keep running the metal rod back and forth over the joint, until it starts to melt and fill up the gap. You will notice when the liquid has begun to form. A word of caution, however, while this is easier of the few methods of welding aluminum, it might still take some time to get right. If the heat is not distributed correctly, the metal rod could start to form clumps on the base material. This will not form strong enough bonds and also look quite ugly. So, practice learning how to weld aluminum without a welder. Here, you can learn how to weld aluminum with a spool gun, since that is one of the types of guns used in MIG welding. The ease of this process depends significantly on the skill of the welder in question. Still, it is one of the many popular ways of welding aluminum. 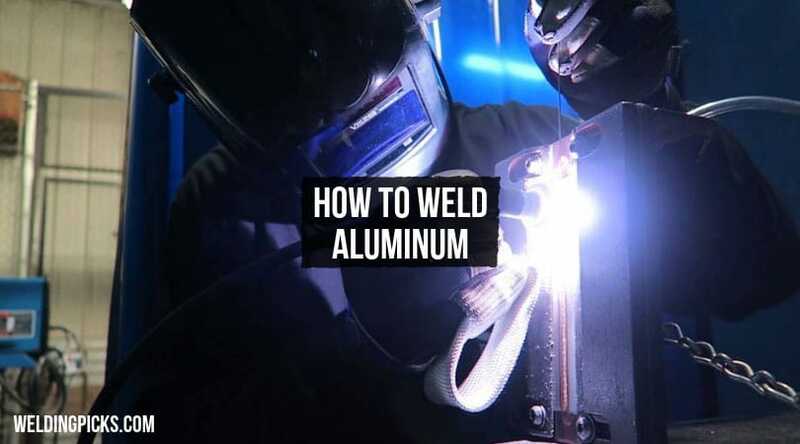 To learn how to MIG weld aluminum, follow these few steps. As aluminum is a very soft metal, it is tough to push it through MIG guns that are typically used. Spool guns, however, provide a shorter distance for a wire to travel through, so, that is best for this process. This particular process uses inert gases like argon, as well, to create a protective shield for the weld. You must make sure that your spool gun is connected to the positive side of the compartment. Now, you will need to insert your aluminum wire into the spool gun. For this, first take off the canister cover of your gun, as well as the contact tip at the very end. Take around eight inches of your wire and clip it. Thread the cable into the gun, place the spool inside the canister and cover it up. You must remember to close the tension arm at the side of the spool gun. Pick out a contact tip that suits the diameter of your wire belt. Then attach it to the gun. Once you install the nozzle as well, your gun will be ready to weld. If you do want to test out the tension on the wire, try it out on an insulated surface. A wire that is too loose, the speed of your wire feed will not be consistent. In a situation like this, increase the tension until the wire comes out smoothly. Make sure the pieces of metal you will work with are not too thin. Before you start welding, clean the aluminum of any oxides with acetone and a stainless-steel brush. When you do start welding, make sure you maintain a steady 10 to 15-degree angle. This is to avoid making the weld look sooty and ugly after completion. You must also maintain enough distance, so the nozzle does not touch the base metal. If it does, you might end up burning it. To weld aluminum, you can also go for a method called stick welding. However, most welders do not believe that it is the best option. While stick welding is quite popular among welders, it does not go too well with aluminum welding. You may want to learn how to weld aluminum with a stick welder, which will require a welder that works on a DC connection. This process also requires electrodes with flux layers. These layers, when melted, form slag, which helps maintain the optimum environment needed for the weld to take place. There are faster ways to weld aluminum products, and those commonly result in better, more accurate and aesthetic yields. Those processes have been mentioned above. If you want to go for stick welding, you can, but the other methods are much easier to control. Aluminum, being a very popular metal, has very high demands in the market. Which is why it is understandable that many people would want to try aluminum welding at home, even as a hobby. Plus, you can make so many beautiful things with this metal, it must be quite addictive, once you get the hang of it. If you want to start a business of aluminum furniture, decorations, etc. could be huge sellers. And you can use some of these methods to make your products!